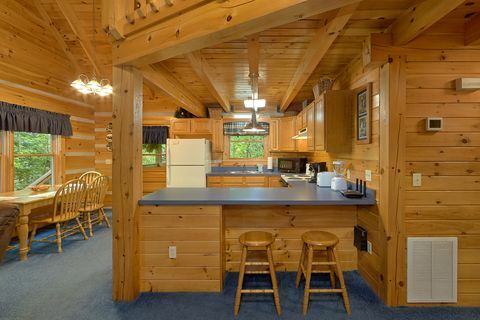 "A Peaceful Retreat," a cabin rental near Gatlinburg, gives guests a cozy cabin with easy access to Downtown Gatlinburg, and the Great Smoky Mountains National Park! 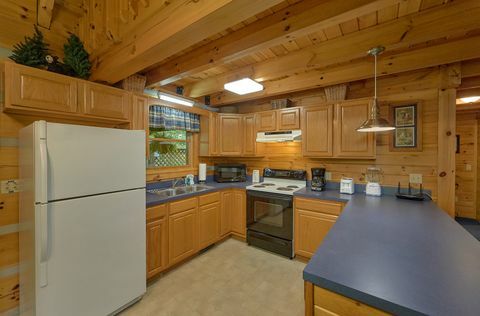 This 2-bedroom Smoky Mountain cabin, located in Sky Harbor Resort, accommodates up to 6 guests in a relaxed, forested setting, but also affords the convenience of a quick drive to the area's attractions. 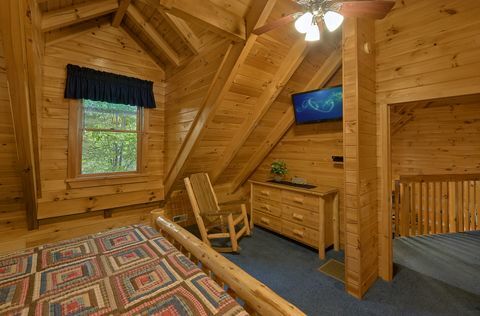 Visitors feel right at home in this Smoky Mountain cabin rental with tons of modern amenities to provide hours of fun and relaxation for the entire family. Stream games and videos with free Internet access! Watch the big game, a movie, or this season's most popular shows on the cabin's three cable televisions with Showtime, local channels, and DVD players! 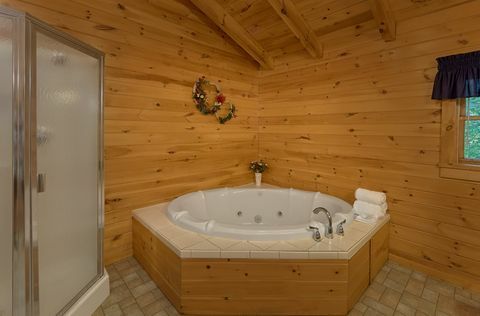 Soak in the family-size hot tub on the deck or enjoy the shade of the deck's covered portion! 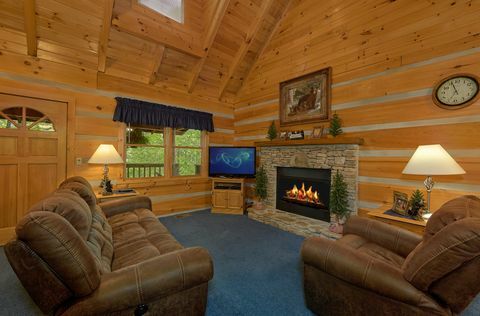 In the winter, enjoy the warmth of the cabin's majestic stone fireplace. 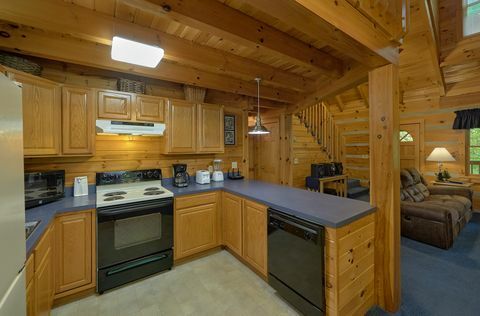 Cook family dinners or country breakfasts in this cabin's fully equipped kitchen or simply host a cookout on the charcoal grill! 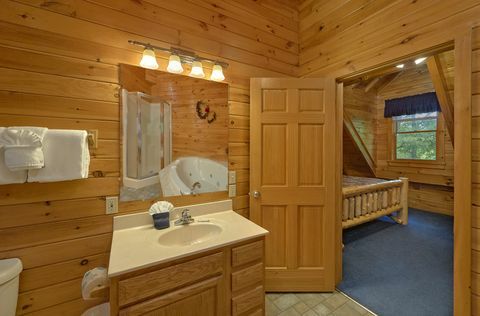 This 2-bedroom cabin rental near Gatlinburg offers an upstairs master suite with a king-size bed, television and a private bath with jacuzzi tub. 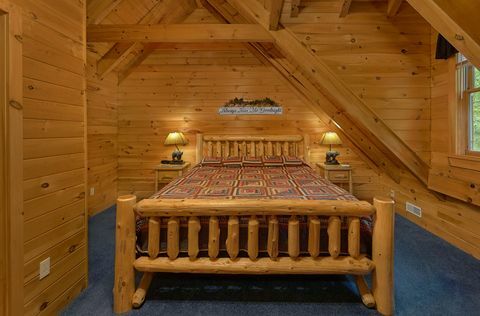 Just outside the master suite is a loft seating area with a sofa sleeper for additional sleeping space. 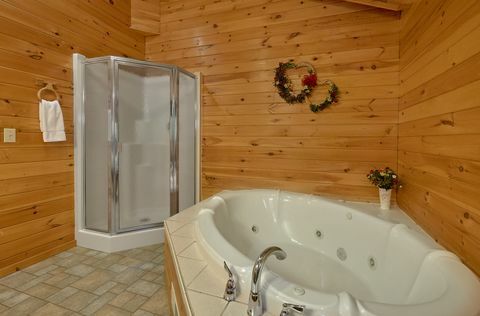 The main floor houses a second bedroom/game room which features a queen-size bed, television, air hockey game, and foosball table. 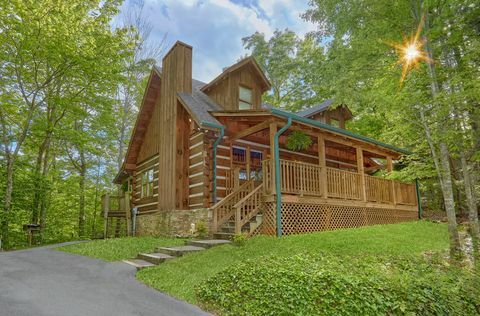 Book this Smoky Mountain cabin rental with Cabins USA Gatlinburg for an immediate Online Cabin Special and take the first step towards a tranquil vacation in nature!